Dear El + Em: A Quick Hi-Five! Good Morning Friends!!! It's been taking me all morning to get this post together in between feedings. This past week there have been a load of hi-five-worthy moments...I couldn't pass up an opportunity to recap a few of my faves! The hard part was narrowing it down to only 5! 1. I'm amazed by how much this sweet little face changes from day to day! 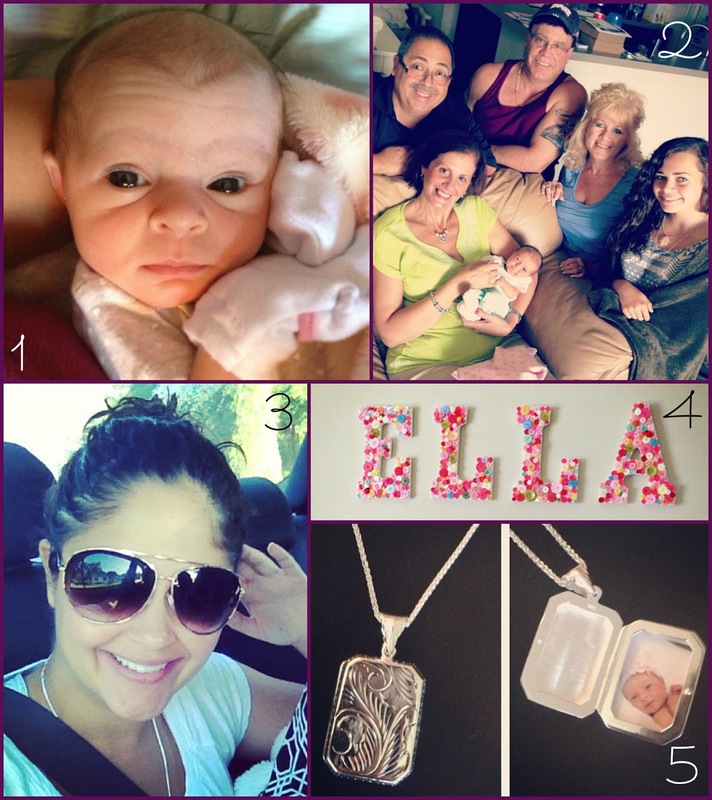 Some days Ella looks like my husband...but lately I've been seeing more of me! She has my lips and nose for sure! I keep telling her either way it is a "win-win"...heehee! 2. I was lucky enough to have family with me during this incredible time. Unfortunately, they had to leave after this past weekend, but I was sure to take hundreds of pictures! 3. Among all the wonderful things I've been feeling these days, showering and washing my hair is right up there! 4. Do you all remember the button project I was working on? Now that her name has been revealed, I could show you all the finished product. Love it! Your DIY button letters came out amazing! Great job! Ella is adorable, and the locket your husband gave you is beautiful! She is a sweetheart - so cute! That locket is really cool! So.. I'm thinking that "we" may have a positive pregnancy test next week here. If so, you're HIRED for buttoning up our baby's name!! XOXO KISS THAT BABY FOR AUNT JAMIE!